This mobile application has been developed to support the Benton Harbor Travel Study effort. Our team will use this app to collect GPS location data from the survey participants. This GPS data will be used to investigate the travel patterns of Benton Harbor Area workers and residents, in an effort to understand how well the transit system is serving their travel needs. Specifically design for Benton Harbor, this application will assist researchers from the University of Michigan and city officials to improve public transportation. With the user’s consent, this application will monitor their location as they move around the city and report this information to researchers and city officials. 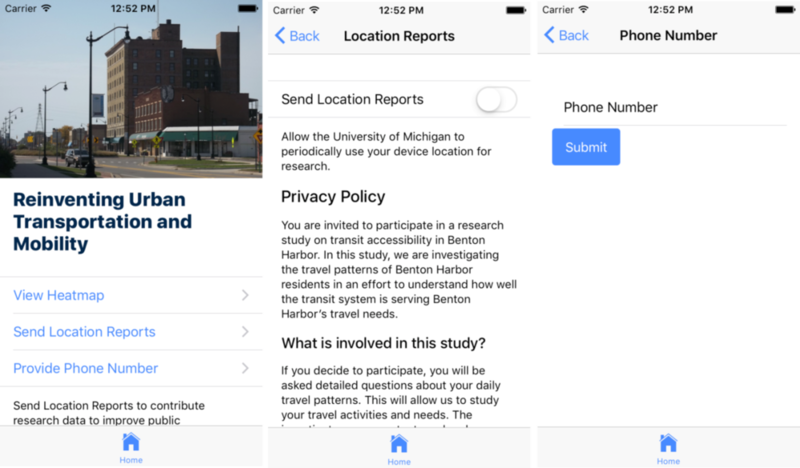 The application also allows a user to enter their phone number so that they may be contacted for future surveys about transit in Benton Harbor. Lastly, a user can see a heatmap of aggregate location data from all users reporting location data in the app. This provides a nice visualization while ensuring individual’s location data remains private.